You are here: Home » MEDIA » Books » 100 Innovations Of The Industrial Revolution: From 1700 To 1860 by Simon Forty (book review). 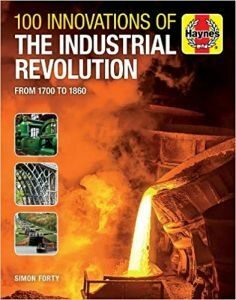 As author Simon Forty explains in the introduction, picking out just 100 choices for his book, ‘100 Innovations Of The Industrial Revolution: From 1700 To 1860’, meant being selective. Even so, this is the era of early steel production so it would hardly be surprising that several of the choices were in its manufacture. This also follows the development in the mechanising of creating cloth with looms and spinning mules and jennys. Although the book is done in year order, when there has to be reference to other sections, some before they are even reached, you do have to wonder if that was a good idea. The same also applies to flax mills, lighthouses, railways, canals, bridges and cement. The impact gets somewhat diluted unless you have a good memory for tracking information down. If you wonder why lighthouses and canals get so much coverage it is because of our dependence on reliable shipping and faster transport. The comment aside, much of the development is in the UK with the USA getting the odd mention. Seeing the diagrams for some of the devices like creating an efficient bright light for lighthouses and how using a tall tower to create lead shot for guns is truly ingenious. With the latter, I always assumed moulds were used but you do need perfect balls to ensure they didn’t stick in the gun bore. Things changed a lot in the industrial revolution as company bosses looked at what they could do to improve manufacturing. Certain labour requirements were reduced but diversity grew into other jobs. This is also the period where paper as we know about it today came about and so did tin cans to preserve food. With the latter, tin cans were a lot sturdier than we have today needing a hammer and chisel to open. It’s a shame the can-opener didn’t get a mention for 1858. This is also a period where we also had the refinement in percussion ignition in pistols that made flintlocks obsolete that carried onto modern guns. The same also applied as gaslight was created in the early 19th century to light the streets. Without that, you would have had to have walked home in moonlight and not at all under a new moon. Seeing the development of stream trains and how rails were made makes for a fascinating study, more so when you have to take into account weight against movement. ‘Puffing Billy’ was the biggest innovation for this in 1810 and pre-dates Robert Stephenson’s ‘Rocket’. The biggest problem was reducing the weight which the latter solved by Stephenson. If you wondered how far back the type of roads we use today started, then you need to go to 1816 where John McAdam had an obsession with making better roads using a base of broken stones with a tarmac, which is named after him, coating raised in the centre to allow water to drain off it. Considering how many roads there are across the world, everyone owes a lot to McAdam. Similarly, in 1824, fast-drying Portland Cement formulated by Joseph Aspdin holds his own immortality in buildings. Charles Goodyear discovered how to vulcanise rubber to make it long lasting. You can have a good game here deciding which was the most important inventions as so many are at the top of the list. The first iron-plated warship was built in 1822 against the belief than it would sink being so heavy. Clearly the dissuaders had never heard of Archimedes. It would be remiss not to mention Charles Baggage and his Difference Engine in 1822 being the first computer. It didn’t actually work because there wasn’t the precision building at the time but his Analytical Engine in 1849 did although beaten by the German version. Something I like about this book is that you get to see original portraits and photos of most of the inventors because it’s nice to put a face to a famous name. Seeing some of their history and how many unfortunately died impoverished because other people infringed on their copyrights and they were busy suing all the time. If nothing else, it showed how bad civil law during that century. Oddly, the last dozen innovations turned out to be the most staggering and also their inventors learning to licence out their creations to ensure they didn’t die in poverty. I always thought it was Merritt Singer that came up with the twin thread sewing machine but it turns out that the American Elias Howe did and licensed it to Singer. The significant improvement in creating mild steel came from Henry Bessemer and his converter. Steel could only get better. Something dear to my body is the hypodermic syringe for insulin and it’s interesting to discover it was invented in 1853 by Alexander Wood. Saying that, it’s also frightening to realise the lack of hygiene and needle sharing back then and the problems caused. It’s a good thing when that was discovered and not throw away the syringe as a bad idea. Other thoughts that came to me as I read this book is the number of times I’s pointed out that you can go and see many of the places where history was made. This would make this book very handy if you want to take your sprogs off to see these things. Even better, they can read this book first and help in the decision rather let you decide. As you might have gathered by now, this is a fabulous book for research and just plain knowledge of when things were first made. If you’re a writer and world-building, seeing how these changes will alter the world will make you think. « Wild Nights With Emily (2019) (a film review by Mark R. Leeper).